How to unlock Sony C1905 by code ? 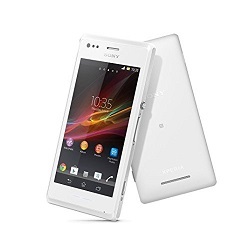 Unlocking Sony C1905 by code is the easiest and fastest way to make your device network free. It doesn't interfere in your system or change it in any way so even after using our code, you don't loose your warranty. In order to receive a network unlock code for your Sony C1905 you need to provide IMEI number (15 digits unique number). It can be found by dialing *#06# as a phone number, as well as by checking in the phone settings of your device. Why unlock your Sony C1905 by code ? Because it is the easiest, fastest and most secure way of unlocking right now. There are a variety of services used for Sony C1905. Most popular is the SONY all networks service, which provides unlock codes for all networks from all over the world. The most important thing to check, before you make an order is the code counter status. Code counter that shows all 0 cannot be unlocked. There are no tries left to enter the code to the Sony C1905. For unlock Sony C1905 following options are available. If you don't know which option use for unlock your phone, please contact us. We will help you choose the right product for your phone. I had to wait a while for my unlock code. But once it arrived was very easy to do. Paid for the code to unlock Sony Xperia M on Monday morning. The code was in my email inbox by Tuesday afternoon and was successful, first time out, at unlocking my phone to use on another network. Great fast and reliable service, cheaper than other quotes I've found. Would definitely recommend this company to others. Thank you. Unlocking instruction for Sony C1905 ? Network unlock code or Sim pin network code is a special type of code which removes the network blockade from your Sony C1905. These messages will appear on the screen of your Sony C1905 when you insert an unaccepted simcard. Sony C1905 has a limited amount of unlocking attempts. Usually all Sony C1905 have 5 tries. If your Sony C1905 has a blocked code counter, there are no tries left, you cannot unlock this device by code. Important !!! Sony C1905 with a blocked code counter will still ask for a network unlock code. What is a Sony C1905 NSCK code? Sony C1905 needs different types of unlock codes to remove the network blockade. Sony C1905 usually asks for this code as soon as you insert an unaccepted simcard ( from a different network ). Video Help film shows what you should do, to enter an unlock code to C1905. super ekspresowo 3 min. sony bez simlocka POLECAM SUPER OBS£UGA KONTAKT TELEFONICZNY RÓWNIE¯. Kod przyszed³ po 5 minutach i naturalnie dzia³a jak nale¿y. Us³uga bez zastrze¿eñ, na wszystko s± potwierdzenia mailowe. bardzo szybko, profesjonalnie, wszystko dzia³a piêknie - polecam. Witam. Xperie M 1905 odblokowalem w 60 sekund :) kod przyszedl od razu wszystko ok . simlock zdjety z orange za 21.99 zl . Kod otrzymany w ci±gu 2 minut Poprawny, wszystko dzia³a idealnie po operacji. Bardzo szybko. Dzia³a w 100%. Wszystko super zadzia³a³o. Szybka transakcja. Super. Kod by³ prawid³owy, simlock zdjêty. Ma³a sugestia, kod sk³ada siê z ci±gu liter, znaków interpunkcyjnych i cyfr. Powinni¶cie poinformowaæ który ci±g cyfr powinno siê u¿yæ. Poza tym firma jest solidna, dostawa na czas, polecam.